We could sit here and flight watch all day. Business Insider spotted the following video that illustrates something very simple in a profound way. 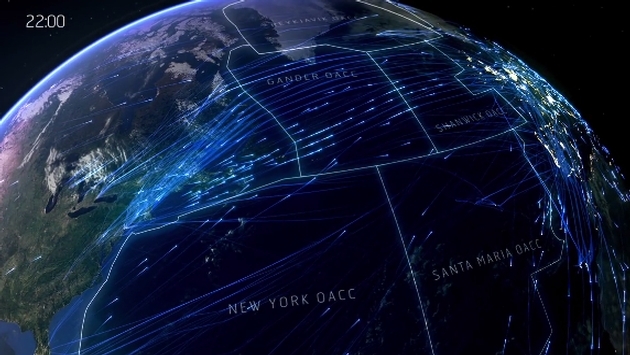 It’s nothing more than a video depiction of 2,524 flights crossing the ocean on an August day, which sounds rather tedious. We think you will agree it is anything but. The blog report handles more than the beauty that is an illustration of the day’s air traffic. It lets us in on some aspects of the infrastructure you may not have known. For example, a great deal of the choreographed dance is maintained without radar. Rather reports straight from pilots are utilized to manage the airways. Perhaps it’s not unlike the lights provided on some freeway onramps, slowing ever so slightly the amount of cars that can get on the highway. In any case, the video piqued our interest, showing how majestic traffic can be. Of course, this is counter to how we feel as we hear our pilot proclaim we are eighth in line to take off. Sometimes you need to get well away from the hall to appreciate the dance.